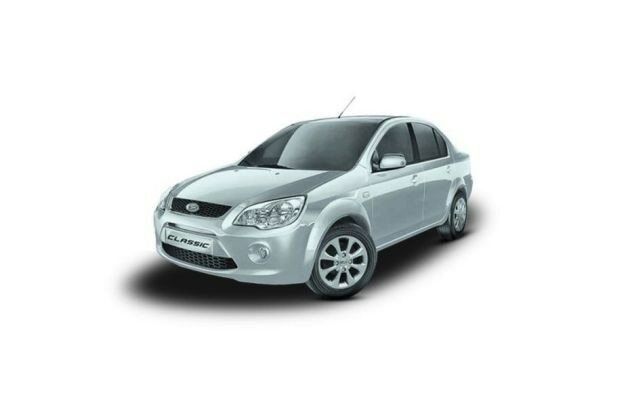 Ford Classic 1.4 Duratorq Titanium is the top end variant in its diesel engine based line up. It is equipped with a 1.4-litre, In-line engine, which comes with a displacement capacity of 1399cc. It has the ability to churn out a maximum power output of 67bhp in combination with 160Nm of peak torque that rather good for this segment. This mill is incorporated with an advanced common rail based fuel supply system. It helps in generating 19.68 Kmpl on the highways and 17 Kmpl in the city traffic conditions. The front and rear wheels are equipped with ventilated disc and self adjusting drum brakes respectively. Meanwhile, the front axle is assembled with an independent McPherson strut with an offset coil spring. While the rear axle gets semi-independent heavy duty twist beam with twin tube dampers. This sedan is blessed with a number of sophisticated features like an advanced music system with a few input options, AC unit with electric re-circulation, an illuminated instrument panel and many other aspects as well. Currently, it is available in quite a few exterior paint options for the buyers to choose from. These sparkling colors are a Diamond White, Moondust Silver, Panther Black, Paprika Red, Sea Grey and Chill with metallic finish option. To begin with the side profile, it is equipped with body colored door handles and external wing mirrors. These are electrically adjustable and fitted with a side turn blinker. The flared up wheel arches are fitted with an elegant set of 14 inch alloy wheels, which further enhances its side profile. These rims are covered with 175/65 R14 sized tubeless radial tyres that ensures a superior road grip. On the other hand, the rear end has an expressive boot lid with a chrome strip, a tail light cluster and a body colored bumper. The windshield is integrated with a defogger and a high mounted brake light. The frontage is designed with a bold radiator grille with a lot of chrome treatment and embossed it with a prominent company emblem in the center . This grille is flanked by a chrome surround crystal barrel headlamps. The body colored bumper has a wide air dam for cooling the engine, which is surrounded by a pair of round shaped fog lamps as well. The large windscreen is made of tinted glass and is integrated with a pair of intermittent wipers. The company has designed this sedan with a large wheelbase of 2486mm and a minimum ground clearance of 168mm. It comes with an overall length of 4282mm along with a total width of 1686mm and a decent height of 1468mm. The internal section of this Ford Classic 1.4 Duratorq Titanium variant is designed in ebony and camel color scheme. It is incorporated with full fabric upholstered seats that provide enough leg space and shoulder room for all passengers. It has 100% foldable rear seat back along with height adjustable driver seat. The smooth dual tone dashboard is equipped with a few features like AC vents, a large glove box, an instrument panel and a three spoke steering wheel. The illuminated instrument panel houses features like distance to empty display, a digital tachometer, headlamps on and door ajar warning notification, low fuel warning lamp and an electronic multi-tripmater for the convenience of the driver. It is bestowed with quite a few practical features like cup and bottle holders, front seat back pockets, bottle holder in front doors, front and rear map lamps and a spacious boot compartment. This trim is powered by a 1.4-litre diesel engine, which has the ability to displace 1399cc. It is integrated with 4-cylinders and 8-valves using SOHC based valve configuration. This power plant can churn out a maximum power output of 67bhp at 4000rpm along with a peak torque output of 160Nm at 2000rpm. It is mated with a five speed manual transmission gear box, which distributes the engine power to its front wheels. It allows the sedan to achieve a top speed of 165 Kmph and can cross the speed barrier of 100 Kmph in close to 12.8 seconds. This diesel motor is incorporated with an advanced common rail based fuel supply system, which produces 19.68 Kmpl on the highways. This variant is blessed with a responsive power steering system, which is tilt adjustable and makes handling easier even in heavy traffic conditions. It supports a minimum turning radius of 4.9 meters. Its front axle is equipped with an independent McPherson strut with offset coil spring, whereas the rear axle is assembled with a semi-independent heavy duty twist beam, which is assisted by twin tube dampers. The front and rear axle are further accompanied by gas filled shock absorbers. On the other hand, the front wheels are fitted with ventilated disc brakes and rear wheels get a set of self adjusting drum brakes as well. This braking mechanism is further augmented by anti lock braking system along with electronic brake force distribution. This Ford Classic 1.4 Duratorq Titanium trim comes with an advanced music system with four speakers and speed sensing volume control function that enhances the ambiance of the cabin. It is also equipped with MP3/CD player, radio with AM/FM tuner, USB interface and Aux-in port. The air conditioning unit comes with electric re-circulation and a heater. Apart from these, it is incorporated with power steering with tilt adjustable function, all for power windows with driver side auto down function, electric boot release, adjustable headrests and a rear center armrest. The list of protective features include drive away locking system along with central locking, collapsible steering column, intelligent rear defogger, fuel cut off inertia switch, PATS (passive anti theft system), front fog lamps and programmable keyless entry along with auto re-locking function. It also has 3-point seat belts for all occupants and dual airbags for driver as well as front co-passenger. In addition to these, it is equipped with ABS along with EBD, which further augments its braking mechanism. 1. Fuel efficiency is quite good. 2. Spacious internal cabin with advanced comfort and safety features. 2. Engine noise and harshness can be reduced. Ford Classic is available in 6 different colours - Paprika Red, Diamond White, Moondust Silver, Chill Metallic, Panther Black, Smoke Grey.